At Valero, we are strong believers that market knowledge and operational experience are critical to achieving premium financial returns. Thus, we are focused on industries where we have the proven experience and established relationships which allow us to quickly learn a new business and add value. We are also focused on technology and product solutions where we have considerable experience and knowledge. We seek to leverage this product and technology know-how across targeted market segments. Finally, we seek investments in niche-focused companies competing in larger markets where there is overall growth. 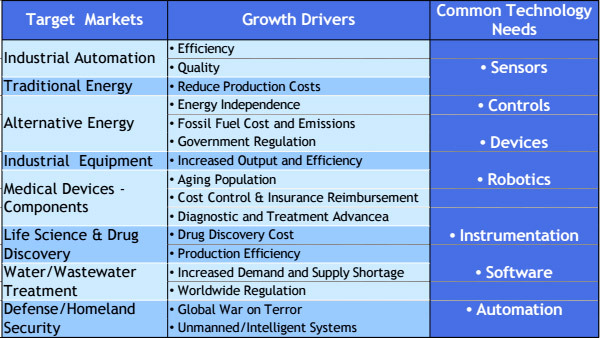 The following table summarizes the intersection of the technologies and markets where we seek to invest.